Strawberries and bananas go together like peas and carrots…only sweeter. This strawberry banana bread is the perfect summertime treat. Do you have access to local strawberries? Use ’em in this bread! If you live someplace tropical you can use local bananas, too! However, store-bought will work just fine 🙂 I love to slather this bread in loads of butter. Yum! doubling this recipe for strawberry banana bread is a breeze! 1. In a mixer bowl, with a paddle attachment, cream butter and sugar together. 2. Add eggs and vanilla, mix well, then add mashed banana and sour cream, mix well. 3. Combined all of the dry ingredients together and add to the banana mixture, mix just until combined. 4.Stir in diced strawberry, mix just until combined. Pour the mixture into a well-greased loaf pan 8″x5″ about 2/3 full. (Or you can use any size of baking pan you preferred.) Here I also add the mixture in two jumbo square muffin tins. 5. Bake 350 deg. F for 50-60 minutes for 1 loaf pan. Bake 40-45 minutes for 2 jumbo square muffin pans. Test the bread by inserting a toothpick in the middle and it comes out clean. 6. Let stand 10 minutes before inverting the bread out of the pan to cool on a wire rack. 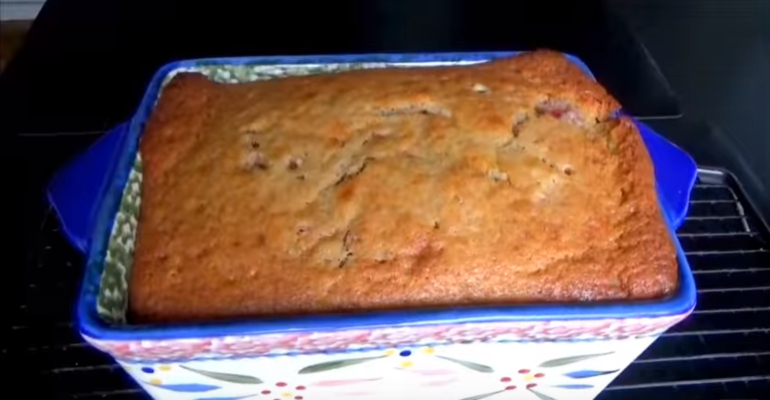 Quick Tip: Make 2 loaves of this strawberry banana bread and freeze one for later.